When I hear of a place constantly being called “fabulous” and featured in all magazines and awards, but without any apparent claim to fame, I tend to be slightly skeptical but almost equally curious. This was the case with the Capella Singapore. Together with the Raffles Hotel, it recurrently tops the list of the most expensive nights in Singapore. I kept wondering what the reason was. Surely it is because it is on the island getaway of Sentosa. It is true, it has sprawling gardens and a multi level infinity pool hidden among greenery, trees and facing the sea. Surely, it is housed on a beautiful building by a famous design firm. But, what is all the fuss about? After staying there twice, I now know the answer. As a friend was visiting and was deciding where to stay, I suggested a booking at the Capella. Money being no object, it seemed like the most pompous and relaxing way to see Singapore and, of course, we would be able to laze around the pool, something that, despite not leaving the island-state, could easily transport you to a more glamorous destination somewhere on the Equator. It was a great choice. That was the first stay. 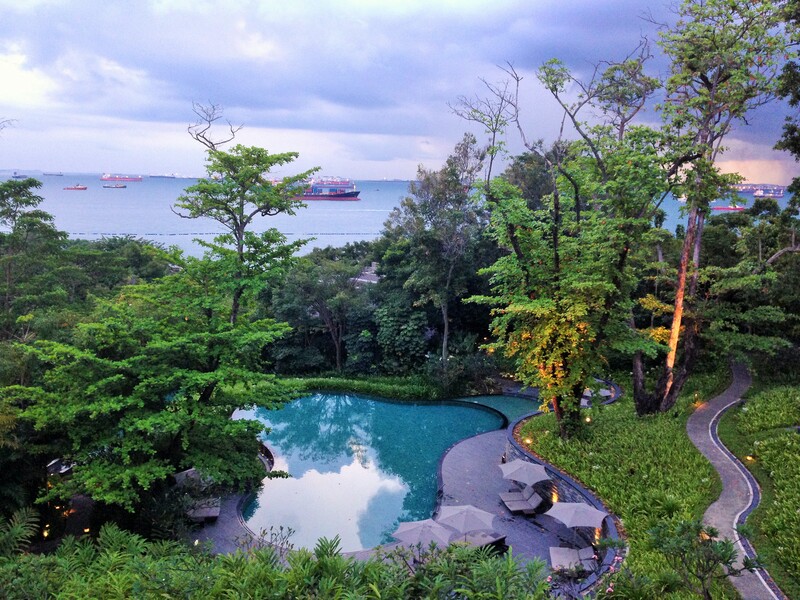 I returned to the Capella Sentosa two years later to find it as incredible as it was that first time. The hotel is tucked away at the top of a driveway and hosted inside British Colonial buildings from the turn of the 20th century. They were originally built to accommodate the British officers of the Royal Artillery, Coastal Defense Command which was based on the island. The hotel was in use by the British Army until the late 50s. Famous architecture firm Foster + Partners took care of the design of the hotel basing it on the existing historical buildings and creating the rest of the property as a modern but flowing structure. As a result, the complex is a mix of old and new; cosmopolitan and tranquil; functional and aesthetic. Aside from the rooms in the main building, villas are scattered around the property and facing the South China Sea and the sea channel, large container ships linger in the background awaiting to empty or fill their guts. Thanks to the lush jungle, you can barely see them. I even wondered if the hotel had an agreement with the ship owners for them not to anchor in front of the property because given the humongous amount of them parked in and around Singapore waters it was shocking to see so few in front of the property. Rooms, even the most basic ones, are luxuriously appointed. Think modern finishing, electric blinds, lighting, sound system and other usual suspects at high-end hotels. Then top it off with a walk-in dressing room and a wonderful bathroom. On my first stay I booked one of the rooms in the main building, above the pool. The room was fantastic. Large windows opened onto a balcony in front of lush trees. 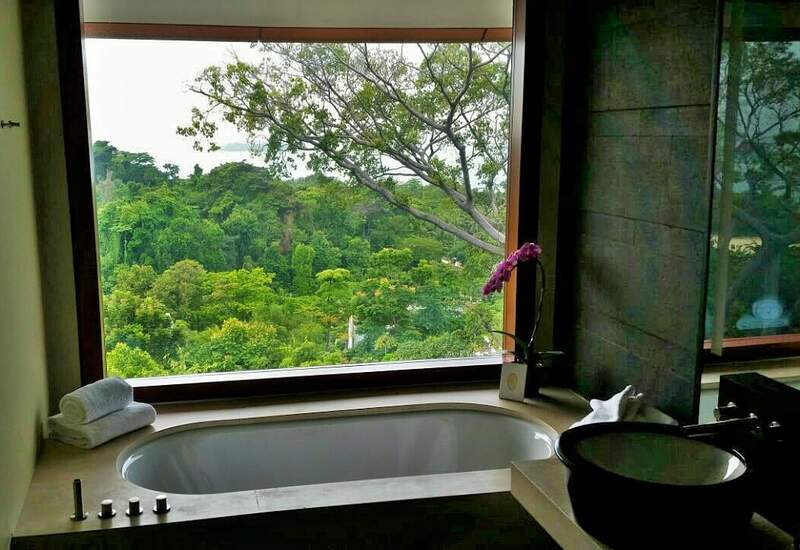 The bathtub was placed by the window with magical views of the sea. The Aesop amenities were divine and the shower a fabulously dark and lavish cocoon. For a breathe of fresh air we could open the doors to the balcony and just sit on the benches and see the sun set. The bed was plush, one of those you sink into. On my second visit, I stayed in a one bedroom villa located by the side of the pool among the greenery and peace. The villas are very spacious and rectangular, like the rooms, with windows all along the main wall opening onto the courtyard and pool. It was much bigger than my apartment. For privacy, the courtyard has tall walls and is surrounded by overgrown vegetation so you cannot see or be seen. The villas come with a plunge pool and an outdoor bathtub and shower. All the same amenities and electronics found in the standard rooms are also present here with electronic commands to operate the curtains and blinds. There was a sound system throughout the villa and a separate living room and bedroom. The villa was a real treat. The entire property is extremely peaceful. You may wander and get lost in the gardens or lounge around the pools only to be disturbed by the passing peacocks, as green and lush as the surroundings. They are unafraid of guests and stare at you inquisitively. If you lose sight, they may even eat your breakfast. There are several levels of pools and the top one is adults-only, making it the perfect place for couples or, in my case on my second visit, girlfriends, to relax with a luscious and sinful pina colada. As the resort is on Sentosa, the beach is not very far. 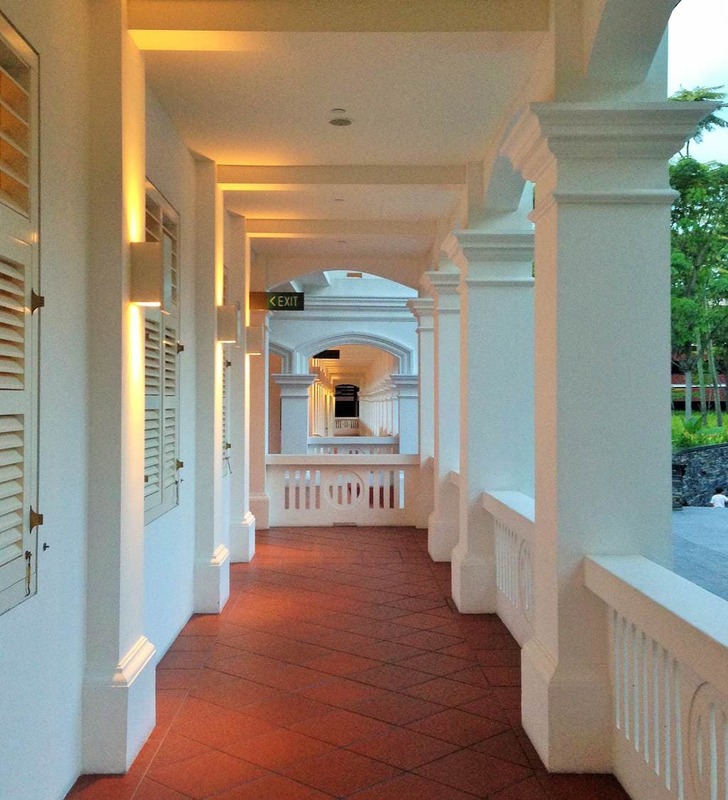 Wandering downhill, the stairs will lead to Siloso Beach and the room access card opens the door back up. The Capella is a tropical wellness getaway and as such, the spa takes center stage. 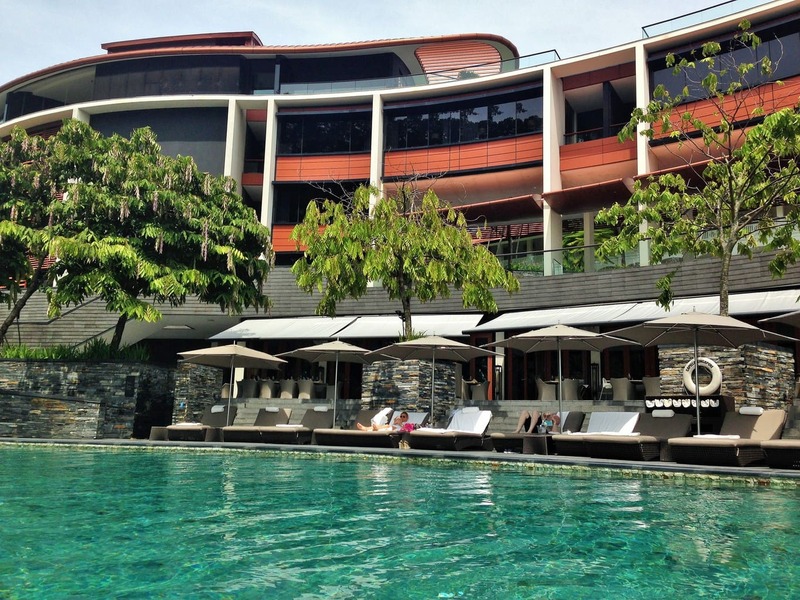 The various treatments and the spa facilities are a great way to relax and disconnect. Before or after your treatment you can use the jacuzzi, the steam room or the cold room. Nothing better to further relax. The Capella has one of the best breakfasts and brunch spreads in the city and, undoubtedly, the best location. Both meals are taken by the pool with the signature in-house peacocks providing added entertainment and surprise. Brunch is opulent, exquisite and with various elements adding personalisation and refinement. There is a choice of several local delicacies including some dim sum and noodles as well as fresh coconuts, in the husk, or kaya spread and butter on toast. The selection of pastries, coming from a croissant fanatic like me, were perfectly soft and flaky, impossible to have just one. On the fresh fruit section you could get your own fresh juice made to order with uncommon and expensive berries like blueberries, raspberries or strawberries, rarely found in hotel buffets. But that was not all. The selection of oysters and the freshest seafood is fantastic too. A team of two people are ready to shuck oysters just for you, on the spot. For meat lovers, there is a stall with all of the elements of a Sunday roast as well as a pasta station. As you are enjoying your meal, the Head Chef or the F&B Manager will drop by to offer some made to order dishes that are prepared in front of your eyes. When I was there on the second occasion the Head Chef was preparing fresh ceviche table side and the F&B Manager offered us the hotel’s specifically distilled raspberry rum that is made in Jamaica and imported exclusively for the hotel. One glass was not enough. For further entertainment, there is a live mariachi band that will sing Happy Birthday, a common reason for people to splurge on the Sunday Brunch, or other important moments. Or simply bring everyone to sing to international favourites. Aside from breakfast and brunch, the Capella also has Singapore’s only Cuban bar, Bob’s Bar, a Cuban cigar and rum bar located above the pool with views of the sea. The cocktail selection, perfect to enjoy on a chilled evening, was large and inspired by Havana’s bygone era. Tapas can be ordered to accompany sunset views and there is live music in the weekends. The Capella is indeed a gem. You may be forgiven for forgetting you are in Singapore. At only 20 mins from the mainland it felt like a world apart. It is a paradise of luxury, a resort on an island, albeit a short taxi ride away from the hustle and bustle of the city. If you ever are in need for any of it. 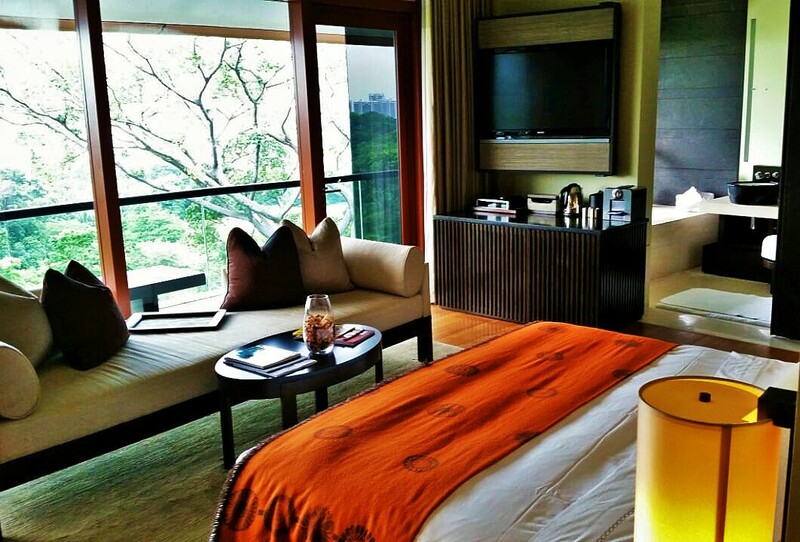 Here are more 5 star hotel choices for your luxe stay in Singapore.